The Unnamed takes us inside the world of Tim and Jane Farnsworth. Tim’s successful law practice allows them to enjoy exotic vacations, beautiful homes, and all the material things exclusive to those with money. Married twenty years, parents of a rebellious teen daughter, Becka, the Farnsworth’s seem to have it all…But, they share a secret, Tim suffers from an affliction that has no name, no list of symptoms to refer too and no cure. This “illness” causes Tim to walk, uncontrollably for hours and hours, or even days on end, until he literally collapses from exhaustion. After sleep has refreshed Tim’s body and mind he calls his wife to pick him up. The long hours Jane is forced to wait for the phone call are excruciatingly painful and are taking a physical and emotional toll on her. When we join the story Tim is once again under the influence of this mysterious ailment that has visited them on two separate occasions in the past. When this undefined, unnamed illness presents itself, their lives are uprooted and thrown, as if a leaf, into the eye of a hurricane – never knowing where it will take them, how long it will last or if they will survive it! As the story progresses Tim is overtaken again and again; forced to roam aimlessly by the nameless disorder. Becka and Jane aren’t entirely certain they are dealing with an authentic physical ailment. And I must admit that I teetered back and forth, one minute believing it was a figment of Tim’s imagination and the next, being convinced it was an extremely rare condition. Author, Joshua Ferris uses symbols throughout the story, to bring the pain and emotional turmoil this family is suffering front and center. 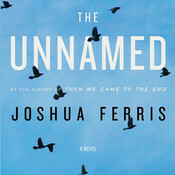 The Unnamed is Ferris’ second novel and although he has avoided the sophomore slump it doesn’t quite reach the level of its predecessor. That said, the two novels are completely different and thus cannot be fairly compared. The Unnamed is part mystery, part domestic drama with neither being fully explored. Ferris does an excellent job narrating the audio version, (available from Hachette Book Group. )This is not the typical story where all questions are answered and everyone lives happily ever after. It is an unusual story that explores what it is to be human, how we love and to what extent we will go for those we care about. and was a National Book Award finalist. Amazon Best Books of the Month, January 2010 .